A pumpkin peeking through the leaves. I love the color of this pumpkin. Now that's orange! These pumpkins are also in my youngest sister's back yard. It's a 'giant' variety, but not the Atlantic Giant variety that produces those monstrous recording breaking pumpkins. Those pumpkins need acreage to allow the vines to grow and support over 1,000 pounds of pumpkin. 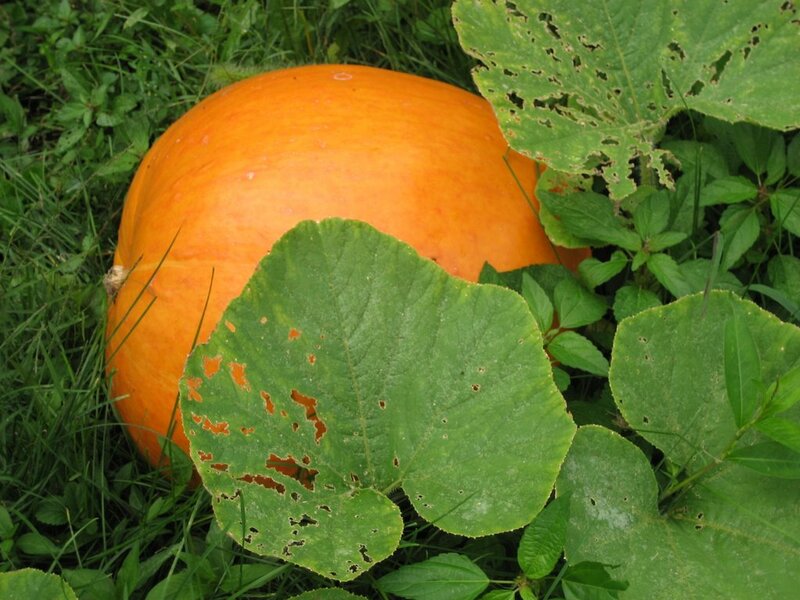 And generally, I think those who are serious about going for a record, allow just one pumpkin to grow on a vine. The current record is 1,469 pounds. Will there be a 1,500 pound pumpkin this year? I think it takes some real devotion and concentration to grow a giant record-breaking pumpkin. I admire gardeners who can have a singular focus like that, who are willing to do all that it takes to even get close to a record. They coddle their pumpkin all through the season. They walk the pumpkin patch to remove any competing fruit, to handpick any insects that dare attempt to attack, to make sure that all conditions are as perfect as they can make them to allow that pumpkin to grow so large. This just in... I heard there is a pumpkin shortage this fall. My sister better watch her pumpkins or one might turn up missing!